Don’t Own A Boat? Join The Club! Continue you growth & learning, as a sailor. Meet and sail with club members of all backgrounds and experience levels. To sail the same boat every week. Members don’t worry about the cost of a boat mortgage, insurance, taxes, maintenance, fuel and slip fees. It’s easy. Simply complete the Basic Keelboat Certification and you qualify for membership. A reasonable “one time” initiation fee, annual dues and a small monthly fee puts you aboard for lots of fun, sailing, educational and social activities. 2019 Fee Schedule for The Passport Sailing Club, Atlanta. Initiation fee $ 1,200 ($ 600 for LSA students), Annual fee $ 200, Monthly fee $ 199. This is a one year commitment. 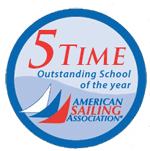 Discount initiation fee to students who join immediately upon completion of class with Lanier Sailing Academy.